The ALPHA laser experiment, shown here, at the CERN lab in Switzerland is taking aim at antimatter mysteries. An innovative laser experiment at the CERN lab in Switzerland has brought physicists one step closer to understanding mysterious antimatter. Antimatter particles have the opposite charge of normal matter particles. When particles of matter and antimatter meet, they destroy each other. Interestingly, however, antimatter behaves similarly to ordinary matter. An antihydrogen atom, consisting of an antiproton and a positron (the antimatter counterpart of an electron), is the antimatter version of a hydrogen atom. Using the Antiproton Decelerator at CERN's ALPHA (the Antihydrogen Laser Physics Apparatus) instrument, researchers combined antiprotons with positrons to form antihydrogen atoms, according to a statement from CERN. Then, the researchers trapped hundreds of antihydrogen atoms in a vacuum and used laser pulses to excite the atoms, prompting them to jump into a higher energy state. Prompting or measuring this change, known as the Lyman-alpha transition, is a method used frequently in astronomy to study dark energy — the unseen, yet abundant force that makes up about 68 percent of the total energy of the universe. When the antihydrogen atoms drop back down to a lower energy state, they release photons. 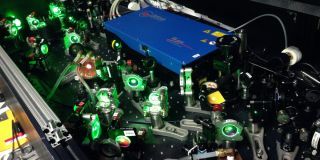 The researchers measured these photons, which revealed that the antihydrogen emissions were the same as those one would expect from a normal hydrogen atom, according to the study, published Aug. 22 in the journal Nature. "The Lyman-alpha transition is the most basic, important transition in regular hydrogen atoms, and to capture the same phenomenon in antihydrogen opens up a new era in antimatter science," Takamasa Momose, lead researcher of the experiment and a physicist at the University of British Columbia in Canada, said in the statement. The ALPHA experiment at CERN. Although the study did not reveal differences in the properties of matter and antimatter, the work is still useful right away: The researchers plan to use this approach to cool antihydrogen, "which will greatly improve the precision of our measurements," Momose said. Next, the researchers plan to use this approach to test how antimatter and gravity interact, according to the statement. "This gets us just a bit closer to answering some of these big questions in physics," Makoto Fujiwara, a spokesperson for CERN's ALPHA antihydrogen research collaboration, said in the statement. "Over the past decades, scientists have been able to revolutionize atomic physics using optical manipulation and laser cooling, and with this result, we can begin applying the same tools to probing the mysteries of antimatter."